^ Newhart, Bob (2006). I Shouldn't Even Be Doing This!. New York: Hyperion. ISBN 1-4013-0246-7. ^ "Ray Romano Biography (1957–)". filmreference.com. Retrieved April 12, 2015. ^ "Albert Romano Obituary". tributes.com. March 12, 2010. Retrieved March 28, 2015. ^ "Ray Romano | Standup to Sitcom | Pioneers of Television | PBS". Pioneers of Television. Retrieved January 11, 2018. ^ Strickland, Carol. "Can Sitcom Make It With L.I. Setting? ", The New York Times, December 1, 1996. Retrieved November 12, 2007. "For Everybody Loves Raymond, the route to Hollywood Hills began in Forest Hills, where Ray Romano, standup comedian and the star of the show, grew up." ^ Critchell, Samantha (May 1, 2005). "Ray Romano and his brothers see the humor in sibling rivalry – and they put it on paper". Online Athens. Associated Press. Archived from the original on October 15, 2013. Retrieved September 6, 2013. ^ a b Gliatto, Tom (October 14, 1996). "Home Truths". People. Retrieved February 15, 2017. ^ Heldenfels, Rich (October 2, 2013). "Mailbag: 'Unforgettable' to return for third season in summer 2014". Akron Beacon Journal. Archived from the original on October 15, 2013. Retrieved March 1, 2015. ^ Messer, Lesley (February 8, 2012). 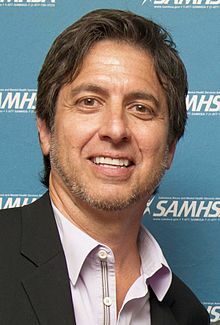 "Ray Romano: My Wife Beat Breast Cancer". People. Retrieved February 8, 2012. ^ ""She Made Me": Ray Romano Credits Late Doris Roberts for Turning Him Into the Actor He is Today". closerweekly.com. April 27, 2016. Retrieved September 29, 2017. ^ "Yahoo Movies – Ray Romano". Retrieved August 23, 2006. ^ gavin6942 (October 16, 2004). "95 Miles to Go". IMDb. Retrieved April 12, 2015. ^ Rice, Lynette (June 19, 2012). "'Parenthood' scoop: Ray Romano to guest star". Entertainment Weekly. Retrieved October 17, 2013. ^ Mitovich, Matt Webb (June 20, 2013). "Parenthood: Ray Romano Books Season 5 Encore". TVLine. Retrieved June 22, 2013. ^ Fernandez, Maria Elena (January 2, 2013). "Ray Romano is happy to be playing on Team Max on 'Parenthood'". Today.com. Retrieved January 4, 2013. ^ Nordine, Michael (February 21, 2018). "The Duplass Brothers Shot a Secret Movie With Ray Romano as Part of a Four-Picture Deal With Netflix". Indiewire. Retrieved February 24, 2018. ^ "Comedian Ray Romano to star in next season of Haney Project". Archived from the original on September 27, 2009. ^ Saracevic, Al (July 16, 2016). "Pairings at the celebrity Tahoe event that we'd like to see". San Francisco Chronicle. ^ Hartley, Georgette (July 17, 2012). "Hollywood, National Football League, National Basketball Association, NHL superstars compete like golf pros for American Century Championship title". Lake Tahoe Blog.